Dr. Roland van Oostveen, author of the FOLC model. 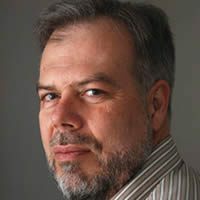 The Fully Online Learning Community (FOLC) model is a framework authored by Dr. Roland van Oostveen, University of Ontario Institute of Technology (UOIT), Canada, for conceptualizing, designing and researching, collaborative online learning in higher education. A social-constructivist model, based on a decade of research and praxis at UOIT, FOLC incorporates problem- and inquiry-based learning, and facets of other key models such as the General Technology Competency and Use, Community of Inquiry, Community of Practice, Transactional Distance and the Teaching Learning Paradigm. Perhaps most importantly, FOLC conceptualizes the teaching function as one of social and cognitive empowerment, and encourages negotiated learning outcomes shaped by the goals, experience, culture and values of the community itself. In this way, FOLC pursues the democratization of education at the level of “the learner,” and positions “learning” as both a fundamental human characteristic and a human right. The dimensional structure of FOLC. Authored by Dr. Roland vanOostveen, UOIT, Canada. Recently there has been an escalation in the number of calls for a paradigm shift in the ways in which employment skills are taught and learned. The fact that these demands come from a wide variety of local and global sources, such as the Conference Board of Canada and the World Economic Forum lends [or gives] credence to the global nature of the problem. All of these sources recommend an increased emphasis on skill development in complex problem solving, critical thinking, creativity, and collaboration. These recommendations match a list of best practice principles for online learning, including group collaboration; active learning; active participation; knowledge construction;, learner-centred pedagogies; meaning-making discourse; and higher level thinking, analysis, synthesis, and evaluation of real world problems. Simultaneously, online learning is having profound effects on institutions of higher education. However, online courses are highly variable with respect to how they are constructed and delivered, ranging from blended learning, where participants complete in-class or at-home tasks and assignments using an Internet connection, to fully online courses, where participants never physically come on campus but interact with each other using a variety of synchronous and asynchronous affordances. As a result, online courses have, perhaps undeservedly, developed a reputation of leaving students feeling isolated, disconnected, and frustrated, resulting in retention and persistence issues. 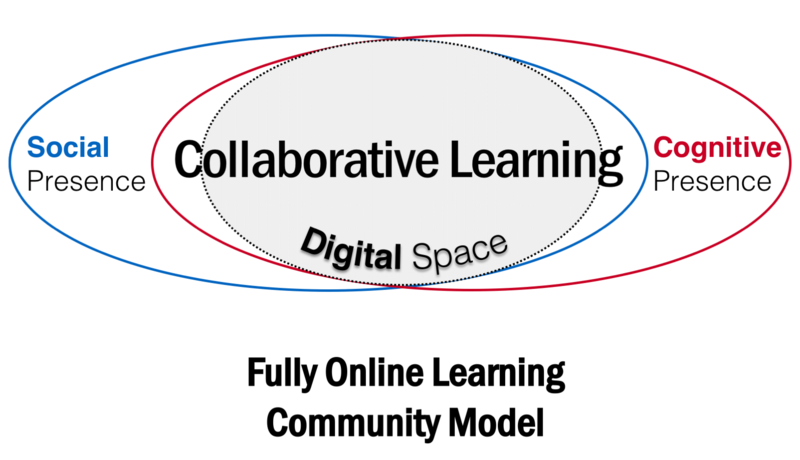 The Fully Online Learning Community (FOLC) model has been developing through research and praxis at UOIT, Canada in a variety of programs (Educational Studies and Digital Technologies, Allied Health, and Masters of Education) for more than a decade. Incorporating a Problem-Based Learning (PBL) orientation, FOLC serves as a foundation for courses in several fully online programs, employing a mix of synchronous and asynchronous communication environments. Today, FOLC represents a significant modification of the Community of Inquiry (CoI) model, and is intended to operate within the Social and Cognitive Presence spaces (see diagram above) to: (a) reduce transactional distance, and (b) simultaneously incorporate newcomers into the established learning community. Within a FOLC-based environment, all participants collaboratively function as co-creators of the learning environment: the Digital Space. The professional instructor often initiates the problem-based- or inquiry-learning process by publishing “real world” situations or contexts online as modified Problem-Based Learning Objects (PBLOs). Participants use these videos to identify and create ill-structured problems. They prepare thoughts and questions (Cognitive Presence), and bring them to hour-long, facilitated, audio-video conferencing sessions. Acting initially as facilitators, instructors and teaching assistants often begin the learning process by eliciting preconceived notions from participants about the problems/ideas identified as relevant to them. The instructors and assistants build rapport and trust so as to challenge pre-conceptions effectively (Social Presence). In this way, they encourage processes of critical thinking and strive to cede control of the learning process to the community. Over time, the community builds processes of collaborative regulation and critical discourse focused on constructing unique, innovative solutions to relevant problems.